At the 2011 Joint Statistical Meetings, Nuo Xu of the University of Alabama at Birmingham presented a paper--coauthored with Xuan Huang also of UAB and Samuel Huang at the University of Cincinatti--in which a Universal Correlation Coefficient is defined and developed. For two discrete random variables `x` and `y`, this coefficient gives the degree of dependency, but not the form of dependency. I've created an R library for calculating this coefficient. This coefficient is useful for programmatically determining, amongst several discrete random variables, which pairs have (potentially non-linear) relationships. where `E(x)` denotes the expected value of `x`. However, this coefficient can only measure linear relationships, and fails miserably for non-linear relationships. That's where the Universal Correlation Coefficient comes in. Well, let's do this by way of example. First, go ahead and load the library (follow the installation instructions on the GitHub README to install the library). Since this example will rely on randomly generated data, let's use the `set.seed()` function to set a particular seed for R's random number generator, and then pick 1000 randomly generated values uniformly selected between 0 and 1 for the variable `x`. Let's create two data sets: `dat_exact_fit` which contains points that perfectly lie on the curve `y = exp(x) * cos(2*pi*x)`, and `dat_xy` which contains points that are almost on the curve (ie we introduce some noise). We'll mostly be looking at `dat_xy`, but the exact fit data will also be useful to reference. And, in fact, the Pearson correlation coefficient isn't helpful for this data, yielding a value of about `0.27`. So, to get a coefficient that measures how close our data is to being on a curve (that may or may not be a line), we'll need to think a bit more generally. In particular, it will help us to move from specific `(x,y)` coordinates to ranks of `y` (in other words, the smallest `y` value has a rank of 1, the second lowest has a rank of 2, etc). Why ranks? Well, go back to thinking about data that lies on a straight line with a positive slope. 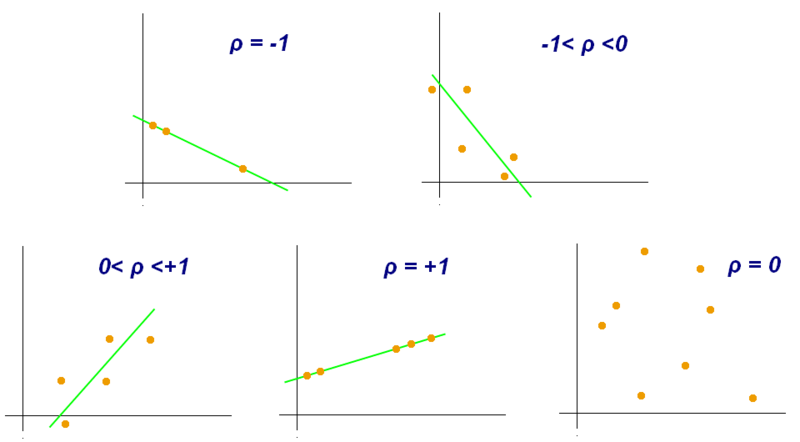 If we have `n` points in our scatterplot, then the `y` ranks--from left to right--are going to be `1,2,...,n`. In fact, this will be the case for data lying on any strictly increasing function of `x`. On the other hand, data lying on any strictly decreasing function of `x` will have the exact opposite rank set for `y`. So, moving back to our data, our first transformation will be to sort it by `x` (in ascending order). There's a built-in function to do that, called `ucc.sort`. The `ucc` library also has a built-in function to determine the ranks of `y`, called `ucc.ranks`. And the function for determining deltas--ie absolute values of successive ranks of `y` with respect to `x`--is `ucc.delta`. Note that this function returns a vector instead of a data frame. Now, this may initially look horrible: the deltas max out at over 150. However, these deltas are "squished" a lot farther down than if our data were random. In fact, let's go ahead and use a different random seed and generate another set of 1,000 random values. Definitely squished down a lot more! All right, enough rambling, already. What exactly IS this Universal Correlation Coefficient?! Let `a` denote the average of the delta of `y` ranks with respect to `x`. It turns out that `a` approximately equals `31.44`. Now, imagine that the set of `y` ranks that we've found was randomly sampled out of all possible sets of `y` ranks for 1,000 different data points. For each possible set of ranks, we can compute the deltas and find the average of the deltas. So, the main question is how does `a` compare to `E(a)`, the expected value of delta averages across all sets of deltas? where `n` is the number of points in our data set. So, for `dat_xy`, we have `E(a) = 1001 / 3 = 333.67`. That's over ten times larger than `a`! UCC_y = 1 - a / E(a) = 1 - (3 \* a) / (n + 1). This represents the degree of dependency of `y` on `x`. Note that the smaller `a` is, the higher the coefficient (and the better the relationship). For `dat_xy`, we happen to have `UCC_y = 0.9057609`. where this time, `a` is the average of the deltas of `x` with respect to `y`. `UCC_x` represents the degree of dependency of `x` on `y`. For `dat_xy`, we happen to have `UCC_x = 0.5447585` (which makes sense, since the curve upon which the data nearly fits doesn't form a function of `y`). And, of course, for `dat_xy`, we have `UCC = 0.9057609`, thus there's a strong relationship between these two variables.